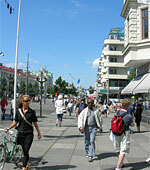 Avenyn in Gothenburg - The Boulevard in Goteborg, Sweden. 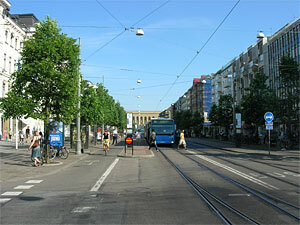 Address: A street who reaches from Kungsportsplatsen up to Götaplatsen. 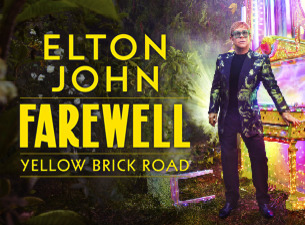 A street in the middle of everything. 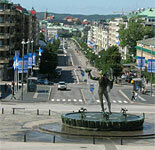 It´s probably the most famous street in Gothenburg. Here you can walk up and down and feel the atmosphere and if you want to do some shopping or grab a bite to eat and drink then you have a fiew places to choose from. Before you arrived to Gothenburg maybe you have heard about this street, Avenyn. This is the place to visit if you want to be seen, eat and drink, maybe go to a show, dance and later in the night have some food again, before you end the day and and go back home. The restaurants and the stores at this street is not far from each other. At the end of the street, at the top at Götaplatsen you can see the statue Poseidon, Konstmuseet och Stadsteatern. 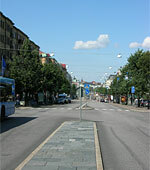 At the beginning of the street close to Kungsportsplatsen you will see Stora Teatern. You can also choose from a couple of different Hotels here at Avenyn. 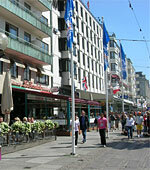 In the summertime the street is packed with people and the same at the outdoors cafe´s. In the wintertime you can see this street be full of light that are glittering in all the trees. We can say that there are something for everyone here! The Street "Avenyn" arised after Sweden announced a cityplan competition 1961. Everything already really started year 1838 when Kungsportsplatsen was torned down. At this time the area between Kungsporten and Lorensberg were only covered by fields and meadows and tobacco plants. It couldn´t look like this in a big city. Houses were built and during the 1880´s the street became the most fashionable street with houses decorated in renaissance style. Several buildings were later torned down, but some buildings are still their today. Along Avenyn there are houses datet back to the last century. Avenyn official website. Note! only in Swedish.